In April 1860 Joseph E. Johnson, a Mormon, established a road ranche at Wood River Centre, today's Shelton, and began publishing The Huntsman's Echo, the first newspaper in Nebraska west of Omaha. He had earlier edited papers in Council Bluffs, Iowa, and Omaha. 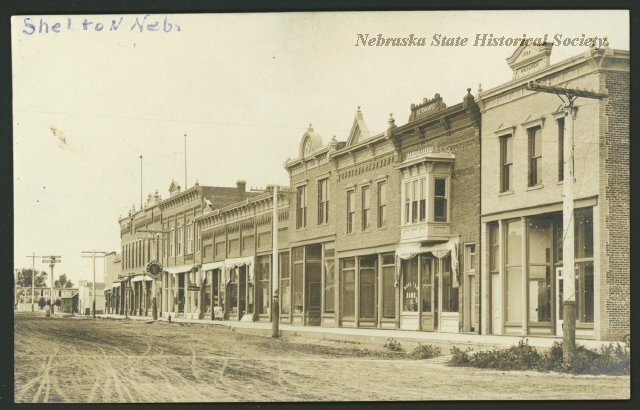 Johnson was a keen observer of the Nebraska scene, which he discussed in a vigorous and breezy style suggested by his paper's motto, "Independent in Everything, Neutral in Nothing." Johnson's Ranche was an important supply point serving Mormons and other travelers on the Council Bluffs Road (Mormon Trail). It included a general store, blacksmith shop, post office, mill, and a farm that grew crops and vegetables. Buffalo and elk roamed the area and the Pawnee Tribe lived nearby. Johnson strongly favored preserving the Union and was appalled by the coming bloodshed of the Civil War. On the grounds that "this Republican reign of terror . . . is too much for our democratic style of free thought, free speech, and freedom," he decided to move west to join his fellow Mormons in Utah. The last issue of The Huntsman's Echo was published August 1, 1861. “Joseph E. Johnson and The Huntsman's Echo,” Explore Nebraska History, accessed April 18, 2019, https://mynehistory.com/items/show/41.